In November 2018, construction was suspended earlier than expected due to winter storms that came through the Palatine area. Prior to the halt of work, the excavation of the parking lot expansion, detention basin, and pickleball area was completed along with most of the sub base. Pickleball perimeter fence posts were also installed prior to the winter shut down. 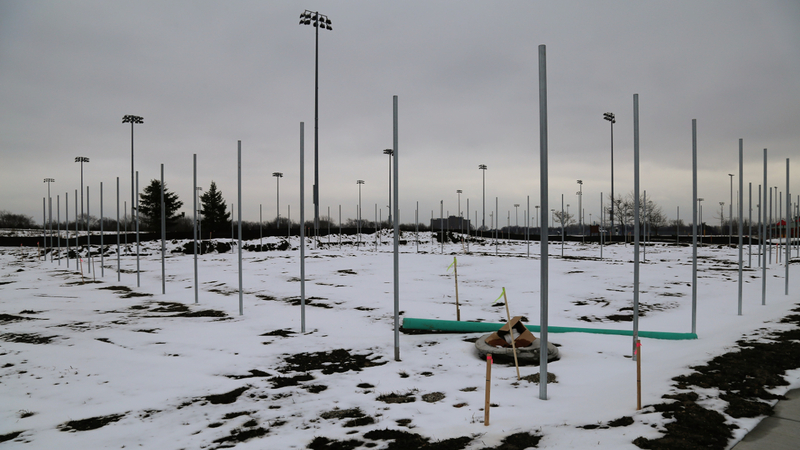 In early Spring when the area dries up, work will resume to complete the parking lot and the installation of drainage pipes from the lot expansion and pickleball courts to the detention basin. This work will include concrete curbing along the perimeter of the pickleball courts and parking lot, and the installation of new lighting fixtures. Once the area has been paved with asphalt, the pickleball courts must sit for 30 days before work can be completed with color coating. It is projected that the whole project will be completed in July 2019, thereafter, a grand opening will be held to celebrate the new outdoor recreation space.